Celebrate GIS Day with us at the 2018 Spatial Forum on November 14. The UMN Spatial Forum is a yearly event highlighting spatial research, teaching, and outreach. This event is free and open to the public and features lightning talks, research exhibits, conversation, and the Borchert Lecture. This event is co-sponsored by the MGIS program, Geography, Environment & Society, U-Spatial, and DASH. 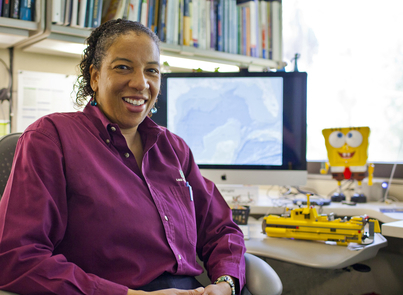 We are pleased to announce that Dawn Wright, Esri Chief Scientist, will give the Borchert lecture this year. This lecture series honors the late John Borchert, UMN Regents Professor in Geography & member of the National Academy of Sciences. To learn more on the importance of Dr. Wright’s research, view Episode 6 of the Let Science Speak, a series of short videos (https://letsciencespeak.com/). Swells, Soundings, and Sustainability in the Ocean will begin with a brief history of how the ocean has been mapped from ancient times to the present. But Dr. Wright will also explain how modern-day mapping systems have become increasingly intelligent. These systems are changing what we measure, how we analyze, what predictions we make, how we plan and regulate, how we design, how we evaluate and ultimately how we manage it all. And yet “here be monsters!” There remain compelling challenges in coping with both the over abundance and paucity of data in the ocean, its multidimensionality, and how to make it accessible to the myriad audiences in great need of it. 12:35 - Spatio-temporal patterns in crop climatologies using G.E.M.S. Last Modified: November 6, 2018 - 10:36am.